Indiana mom finds metal rod in child's Halloween candy. CORYDON, Ind. 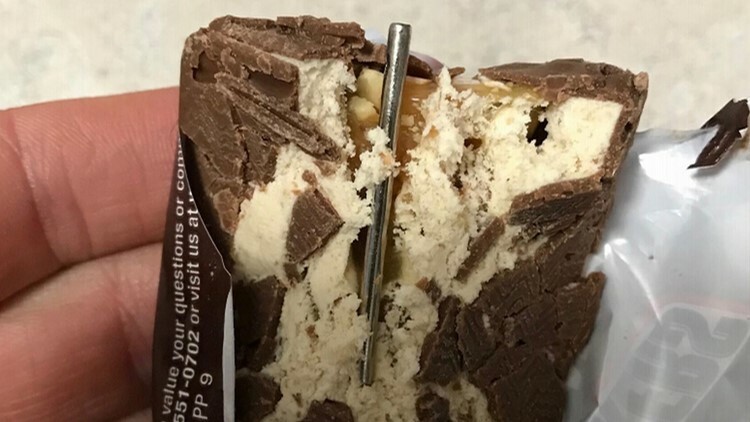 (WHAS11) -- A piece of candy is now a piece of evidence in Corydon, Indiana after one mother told WHAS11 News that she found a metal rod in her daughter’s Halloween candy. Wisnoski said she took her daughters trick-or-treating on Walnut Street in downtown Corydon. She was sifting through their treats later that night when she noticed the chocolate bar wrapper was already open. A closer look revealed the piece of metal. “They have metal detectors before anything leaves the building so they think their metal detectors would've noticed this,” Chief Kitterman explained. Chief Kitterman said they'll use the wrapper to try and track the candy back to who bought it and see if this was intentional. “You never know what people are capable of, my hope is that that's not what it is, but if it is, we will do what we have to do to bring them to justice,” Chief Kitterman said. Chief Kitterman says he's never come across a case like this before, and it appears to be just as rare on a national level. Professor Joel Best at the University of Delaware has been tracking cases of sharp objects in Halloween since 1959. He said of the hundred cases he's come across, more than 90% were hoaxes.